cupuaçu butter and buriti oil are included to absorb the sun's UV rays. This formula is enriched with rice proteins that strengthen the cuticle of the hair, restoring shine and manageability. Its 15 herbal extracts and fruits from India and the Amazon Rainforest complete the formula's deep hydrating and conditioning effect, restoring the health of your hair. This product was made without any GMOs, no animal ingredients and was never tested on animals. I have colored hair and it is damaged. My daughter's hair is bleached and hers is very damaged. Both of us use this mask. Our hair becomes soft, silky, shiny and extremely manageable after using this mask. It is like a miracle. I highly recommend this mask. It is inexpensive and worth every penny. It is worth more actually, but don't tell them that! The Surya Brasil Color Fixation Restorative Hair Mask retails for $10.49 (7.49 oz./225 g). It can be purchased online at www.suryabrasilproducts.com. 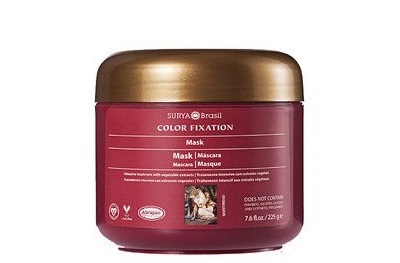 Like Surya Brasil on Facebook: https://www.facebook.com/suryabrasil; Follow Surya Brasil on Twitter: @suryabrasil; Follow Surya Brasil on Pinterest: https://www.pinterest.com/suryabrasil/; Follow Surya Brasil on Instagram: https://www.instagram.com/suryabrasilbeauty/ and Subscribe to Surya Brasil on YouTube: https://www.youtube.com/user/suryabrasil.